Next iPhone to be smaller and thinner? It’s looking as if those rumors about a smaller, thinner iPhone with a larger edge-to-edge screen might be true. At least the CEO of France Telecom/Orange thinks so. Talking about Apple’s smaller SIM card, he confirmed that carriers, including Orange, are working with Apple on the new initiative and said that Apple’s next-generation iPhone will be smaller and thinner. He specifically says the “next” iPhone, as in the fifth-generation iPhone, but the comment could just be a guess based on the smaller SIM card developments. But the other way to take the comment is that the next iPhone is actually an all new, thinner, smaller design. Can you tell that the wait to find out is killing us? The white iPhone is always making drama. We have followed it’s twisted and sorted saga for awhile now and we thought it would stop now that the device is available. But no. The latest drama surrounding the white iPhone 4 is in regards to it’s thickness. 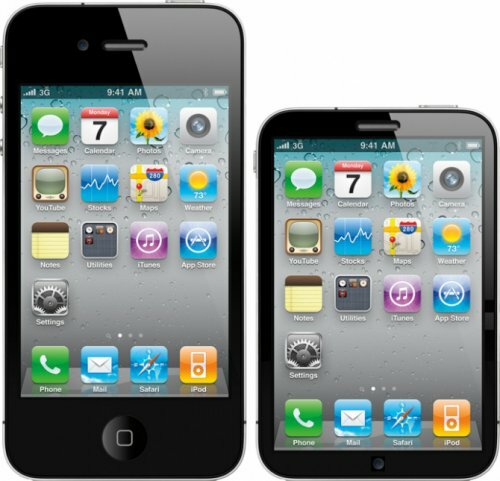 Consumer Reports is now disputing claims that the white iPhone 4 is thicker than its black counterpart. 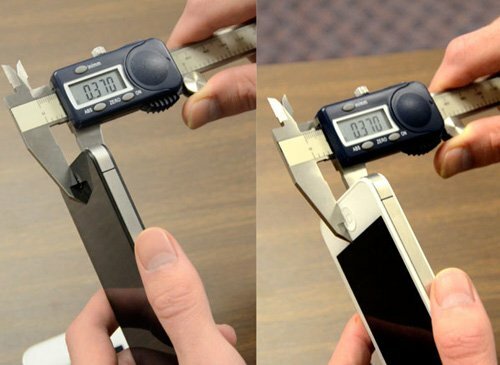 Using calipers, they claimed both color iPhones were about 0.37 inches. It went so far as to try three cases and said that all three fit just fine. The latest in the ongoing saga of the white iPhone 4 is that it is thicker than the black model. The image above demonstrates the point. That’s just the latest problem in addition to shipping ten months late. But the size issue may create a problem for owners as well as case makers. For instance, the Incase slider which fits a black iPhone 4 has to be forced into place on this model. So will your case fit or won’t it? We can only guess that it is thicker do to added UV protection among other things tweaked. Good luck with your current case and we hope it fits. Looks like some White iPhone 4s are already hitting retailers around the world. And it is about time. That’s what the photo suggests. Belgian retailer, Van Roey, says that it has also received its first shipment, as shown above. The company says it is starting to sell them, although shipments are limited to addresses in the Benelux area for now. Lucky buggers. 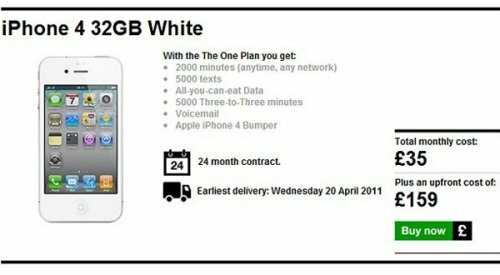 So it would seem that white iPhone 4s are pretty much guaranteed for an official launch on April 27th, just like we had heard. The hardware is already in Best Buy retail systems, and it was even put on sale in the UK last week, prematurely. The white phone should be available through most carriers, AT&T and Verizon included. Are you getting a white iPhone? We’ve seen our share of iPhone cases, but the Carbonite iPhone Case may be one of the best. Avert your eyes Steve Jobs fans. Your mighty leader has been encased in carbonite. I picture Bill Gates twenty years from now, totally fat like Jabba the Hutt, taking out a bounty on Jobs. Soon enough Boba Fett catches up to Jobs and there ya go. He’s in carbonite. 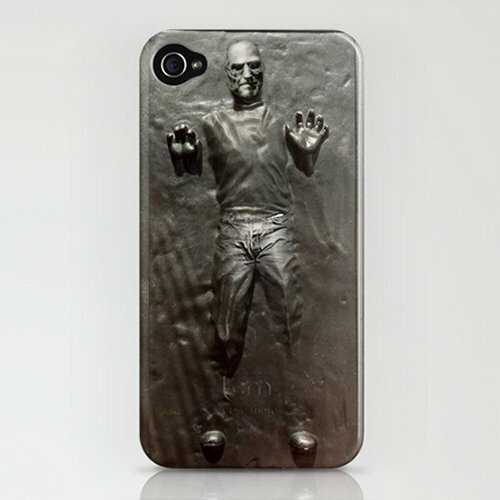 The Steve Jobs Carbonite iPhone Case will cost you $35. Photo of ‘iPhone 4S’ with Larger Screen? 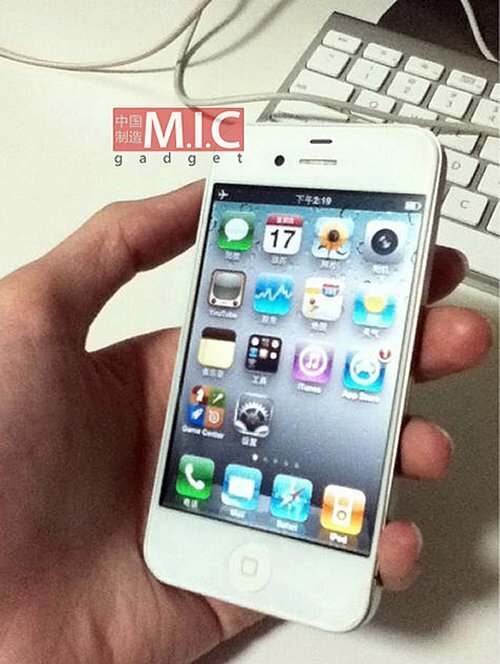 This photo comes from MIC Gadget and they claim that it could represent the “iPhone 4S”. The image shows a white iPhone 4, or what looks like an iPhone 4, but with a larger display. It could be just a mockup, but at any rate it clearly has a larger display and edge-to-edge glass. They didn’t say how they got the image either so we have no way to say if this is genuine or not, however it seems like this is a move that Apple would make with the next iPhone. It also closely resembles some leaked renders and images that surfaced earlier in the year. Stay tuned on this one. Apple to ship new iPhone in September? According to some people in the know, Apple’s next-generation iPhone will have a faster processor and will begin shipping in September. Production of the new device will start in July/August and it will be very similar to the iPhone 4. That’s great news for Apple fans and it still leaves us plenty of time for more rumor and speculation. Put your thinking caps on and start guessing at what we can expect from the iPhone 5. The white iPhone 4 has been a huge pain for Apple and for anyone wanting one. But now it looks like the wait may finally be over. That’s because UK carrier Three has just put up a product page for the white smartphone. The 32GB version is priced at £159 ($259) on a £35 per month agreement. 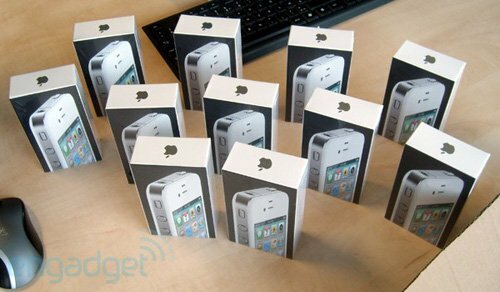 The first white iPhone 4 handsets will ship on April 20, or this Wednesday. According to the product page at least. Hopefully this will be the end of it and you can hold it in your hands very soon. Looks like the iPhone 4 is about to hit another milestone. It will soon be the most popular camera on Flickr. The site’s Camera Finder shows Apple’s phone ready to overtake the Nikon D90 and it has already passed Canon’s EOS 5D Mark II, Rebel T1i, and Rebel XSi. Flickr notes that the graphs only track shots with metadata identifying the camera and might omit shots from any platform that has had the information omitted. Some editing tools also either have the option to clear out metadata or will do it by default. D90 users and other DSLR users are more likely to use editing tools than iPhone owners and that will certainly skew the results. Still, we don’t doubt the power of the mighty iPhone 4. 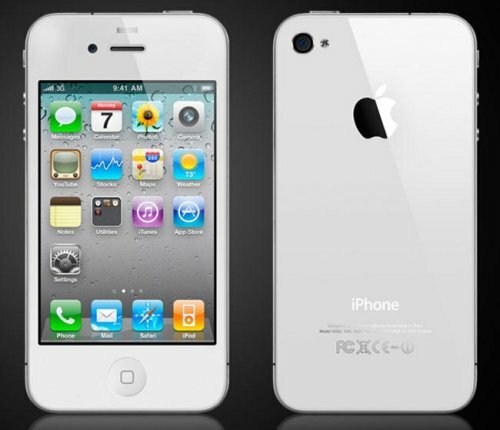 Yesterday we heard the latest rumor that the white iPhone 4 is currently in production. Well, now it is official. Apple says that the white iPhone will be released in the spring. The company had previously indicated that manufacturing problems had delayed its release. Good news for those of you waiting on this snow white phone. It gives everyone something to look at while we are waiting for the iPhone 5 too. So are you buying a white iPhone or will you wait for the new iPhone 5? We had heard talk of the white iPhone 4 possibly shipping in April and now it looks like we can narrow down the timing thanks to the latest rumor. Both AT&T and Verizon will get the long-delayed and long-awaited white iPhone by the end of the month. Bloomberg stated that the manufacturing issues they were facing were worse than everyone thought and that the original white paint had been peeling when exposed to heat. Apparently, a sensor was also a problem, according to one tipster. It might have been the proximity sensor on the front, but that isn’t confirmed. So, we will hopefully have an end to the white iPhone saga very soon. You can already capture still photos in 360 degrees, but what you really want is a way to capture panoramic video as well. Us too. And we aren’t the only ones. 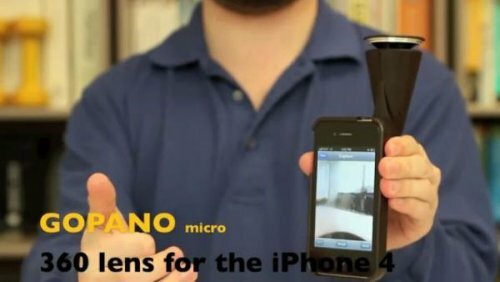 That’s why EyeSee360 has given the iPhone 4 the ability to record video in 360-degrees with the GoPano Micro. It consists of a case for your iPhone, a detachable 360-degree lens(Obviously), and the GoPano app. It will allow you to do a circular pan with the simple swipe of a finger. How fancy is that? Looks like it has met its $20,000 funding goal, so we should be seeing this very soon. Awesome. Who doesn’t love a game of pinball? Sadly those quarters add up and it can get expensive. Plus Pinball machines take up a lot of space. That’s why we play virtual pinball games on our phones and computer, but this doesn’t equal the same kind of fun. Pinball Magic won’t give you the same experience as a full-sized pinball machine, but it will give you the experience of playing pinball on a machine designed for tiny people. It will work with a free pinball app that’s available from the Apple App Store, and it works with all iPhone and iPod Touch models that use iOS 3.0 or higher. Just $64. White iPhone 4 coming in April? 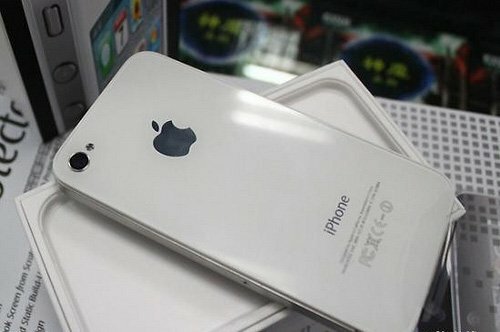 According to Concord Securities analyst Ming-Chi Kuo, the white iPhone 4 is finally going into mass production this month. The goal is apparently to ship them in April, though the initial run will likely be restricted to GSM models and not include the CDMA version by Verizon. Right now we don’t know of any timeframe for a white CDMA phone. Apple has promised white models since the iPhone 4′s launch way back in June of 2010. But Apple has had to delay several times and their most recent goal is for a “spring” release. And when the iPad 2 was announced last week, Steve Jobs emphasized that white tablets would be available at the same time as black ones. 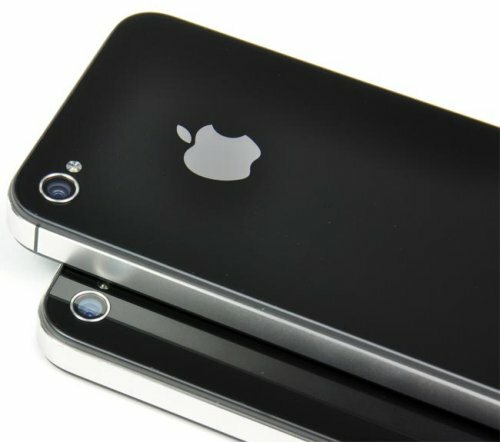 A new rumor suggests that the iPhone 5 will have an aluminum back to replace the iPhone 4′s glass back. 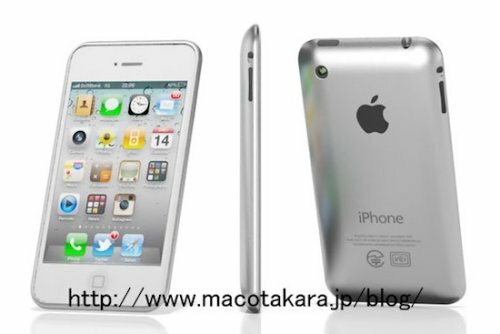 Along with the new chassis, there will also be a redesigned antenna that does away with the external design in the iPhone 4. You might remember that this issue led to Antennagate. 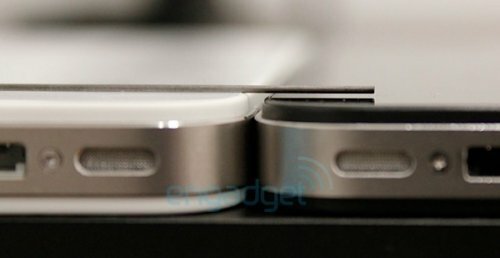 The new antenna will put the iPhone’s antennas back into the Apple logo, similar to the way the Wi-Fi iPad housed its antennas. There was even a patent that turned up recently that suggested Apple was working with Apple logo antennas for the iPhone, so this makes sense. I guess we will find out soon enough.